(NORTH BAY, ONT.) – Today, Canadore College’s president George Burton and The Village’s co-chairs, Judy Sharpe and Mark Deacon unveiled the campaign plans for the College’s community health and wellness centre. In October 2016, Canadore announced that it would be building a unique multigenerational academic and living facility on its campus. Indigenous, Eastern and Western healing and wellness practices by carrying out class-leading interprofessional education. These applications will provide a continuum of care while supporting leading-edge applied research. The Village will be home to a traditional Indigenous healing lodge and custom-built classrooms that link to activities including community gatherings, celebration, ceremony and smudging rooms, teaching lodges, sweat lodges, growth and harvesting of traditional medicines. Spaces to support students’ spirituality to actively promote wellness and healing are designed throughout. 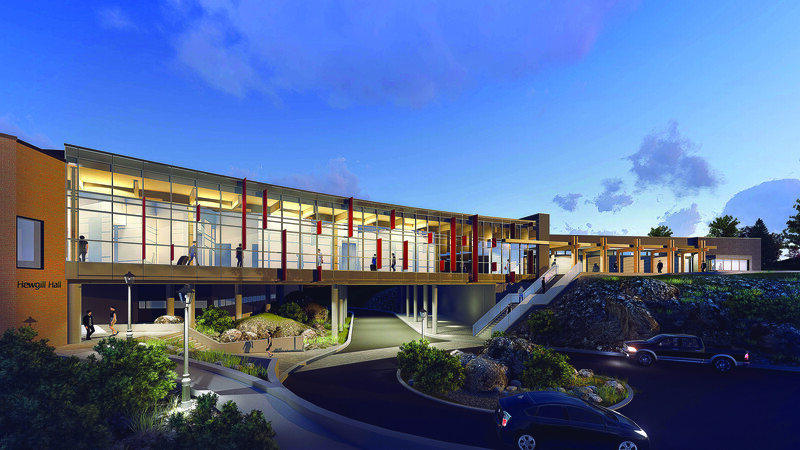 The Village academic and living facility will incorporate Canadore’s School of Health, Human Care and Wellness and First Peoples’ Centre program delivery and a number of student-led health clinics open to the general public. It will also become an applied research site for the development and testing of new medical, wellness and mobility technology. The project, including construction and technology, is valued at $20 million in total and the campaign goal is $5 million from non-government sources, with $2,050,000 already being secured from donors. Since the project’s initial planning stages, The Village’s fundraising has been guided by a campaign committee made up of community leaders and college employees: George Burton, Mark Deacon, Carrie Dokis, George Flumerfelt, Brad Gavan, Corina Moore, Kayvan Rouhani, Judy Sharpe and David Silveri. To learn more about The Village and how to make a donation, contact the Canadore Foundation by contacting Brad Gavan at 705.840.3473 or bradley.gavan@canadorecollege.ca or Carrie Dokis at 705.475.474.7600, ext. 5147 or carrie.dokis@canadorecollege.ca. The Canadore College Foundation was formed to raise funds to allow Canadore College to continue to provide outstanding applied education and training for an ever-changing world.